This week I was reminded of the importance of networking on the web. It’s not a term you usually see associated with genealogy. But, we have to reach out on forums, blogs, message boards, and whatever sources we have because you never know who might have the tidbit of information you need or a forgotten photograph that you’ve never seen. 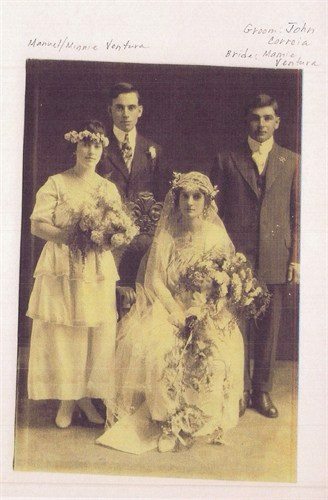 It is the wedding photo of Mamie Ventura and John Correia, ca 1918. The person who sent it to me is a new found cousin and is related to the Correia’s. As I was reading the notes I made an astonishing discovery. I immediately recognized Mamie’s brother, Manuel Ventura. But, I would have never guess the young woman on the left was my own great aunt, Minnie (Ventura) Pacheco Smith! I have one photo of her take maybe 5 years after this one. It is Manuel’s wedding photo (to Isabella Pacheco de Braga). All the other photographs of Minnie come from the 1930s and 1940s. You can imagine how excited I was to get this one from her teen years. The person who had this had no idea of my relationship to Minnie. When she sent it on, she was filling in my gaps on the Correia family. It makes me wonder how many photographs might be sitting in dusty boxes in Hawaii or California that have my relatives pictured. I suspect it’s many. By 1970, my great aunt, Maria (Pacheco Smith) Souza/Correia, her second husband, Anthony Correia, and my grandmother, Anne (Jackson) Shellabarger, were the only ones left from that generation in the Pacheco Smith clan. My Grandma had cut ties in the 1960s. I am sure most of the Pacheco and de Braga cousins have forgotten about this side of the family–especially those in Hawaii who probably hadn’t heard the surname in decades. This makes me want to redouble my efforts to find cousins. As each year goes by we lose another part of a generation. There are fewer and fewer people to pass down stories and there are even fewer who can name the people in old photographs. It becomes even more important to compare what we have so we can save whatever there is of our heritage.